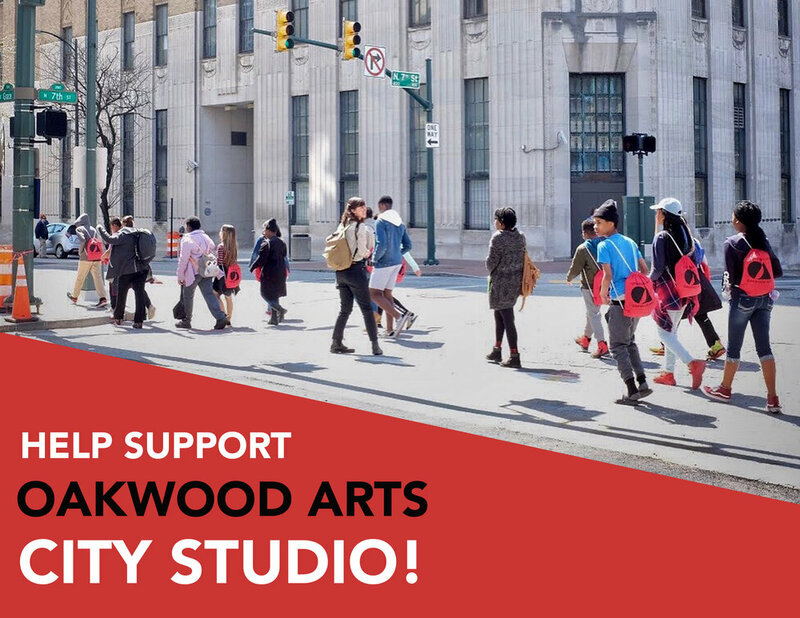 Oakwood Arts’ City Studio is a week long camp for middle schoolers from Richmond Public Schools. Each year we focus on different creative careers related to design and three-dimensional environments. This year’s theme—production design—took us everywhere from the Virginia Film Office to the VCUarts theater department to the Virginia Opera. We toured TV and theater sets, observed a photo shoot, created moodboards with advertising pros, met with costume designers, and more. And all of this was 100% free for participants. Our third day of City Studio was packed! We kicked the day off with a trip to the Northside, where we met up with Lori Russell, locations manager for the Virginia Film Office, who led us on a tour of the studio where Turn, Homeland, and HBO’s Harriet were filmed. After exploring the sets and learning all about the film industry in Virginia, we headed to Boulevard Burger in Scott’s Addition for lunch, then to Tilt Creative + Production, where we got to observe a photo shoot. This was followed by a talk by production designer Andrew Carnwath and senior producer Sylvester Tucker, who told us about the various projects they’re working on, what their jobs entail, and how they got where they are now. Our final guest speaker, Matt Wallin, a special effects artist and professor of communication arts at VCU, was a huge hit. Everyone loved learning about the projects he’s worked on. We spent the rest of the day putting all that we learned during the week into practice by creating set designs from scratch. Our final projects included sets for a play about a dream that becomes real, an animation about a girl who can time travel, a movie about an elephant that escapes a zoo, a commercial about donuts that give you superpowers, and a movie about a magical waterfall. Families joined us in the evening for a potluck dinner and a presentation of the students’ hard work. Our second day began with a visit from costume designer Johann Stegmeir, an associate professor of theater at the University of Richmond. He taught us about the history of set design and showed us models of a few of the sets he has designed over the years. We then made our way across town on the Pulse and visited the VCUarts theater department. There we met with costume technology professor Neno Russell and graduate student Emily Laurelle Tappan, the costume designer for The Three Musketeers (onstage later this month at the Singleton Center). Later, we headed to the prop shop, where we met with Douglas Brown, who gave us a wonderful overview of technical careers in theater. We also got a sneak peek at some upcoming productions, including a demonstration from Musketeers lighting designer Travis Stoy. Staff from the Virginia Opera showed us around the Dominion Energy Center. The tour began with the main stage, giving us a whole new perspective on the front of the house. We got to go backstage, and even took selfies in the “Stars” dressing room. While there, we visited the set of An American Dream in the black box theater. After sharing a meal outside on the Capitol grounds, we boarded the Pulse and headed back to our space to begin designing our own sets. City Studio doesn’t end after spring break! We have started an ongoing after-school club that focuses on design and three-dimensional environments through workshops, field trips, and discussions with design professionals. Through our meetings, students dive further into understanding the role of design in everyday life. Thanks to a sponsorship from 1708 Gallery, our City Studio club was able to take a field trip to this year’s InLight exhibit to view and document the exhibit using photography! Students also joined in the festivities by participating in a lantern making workshop, and visited with artists as they installed their final pieces. Check out some of our student's photographs from the night, as they captured the installations and learned to draw with light! Work by: Jeremiah Andrews, Anthony Bullock, Lamya Coleman, Danae’ Monroe, Pierre Johnson, Aasia Robinson, and Albert Simms. Leading up to our field trip to 1708’s InLight Exhibit, our City Studio group took a trip to the Institute for Contemporary Art, to gain inspiration from Rashid Johnson’s Provocations installation and to view their Hedges, Edges, Dirt exhibit. We then headed to Studio Two Three to visit with artist Steven Casanova, to learn about his artistic process, as he created his piece for the Inlight exhibit. Help fund City Studio, an design program we piloted during Richmond Public Schools’ 2018 spring break. Over the course of the week, middle schoolers from the East End are introduced to different creative careers related to design and three-dimensional environments through field trips, conversations with a range of professionals, and various hands-on activities.